Corrugated roofing is still widely used in many rural areas, as well as military communities. Its ability to be easily transported, along with its lightweight properties, have been reasons why countries like Australia adopted its use as far back as the 1840s. Corrugated roofing was invented by the British architect and engineer Henry Palmer, who worked for the London Dock Company. It was originally known as CGI, which stood for corrugated wrought iron. In its earliest form, CGI exhibited strength, corrosion resistance, and convenient transportation, all of which led to its desirability in the production of prefabricated structures by skilled workers. Soon thereafter, CGI became known as a staple construction material in the United States, New Zealand, Australia and India, to name a few. During the 1900s, Australia adopted corrugated roofing as part of the attractive architecture that became a piece of their cultural identity. Up until around 1900, corrugated sheet metal roofing was mainly only used for commercial and industrial purposes. A drive through an agricultural or industrial area of America or Australia would commonly bring about scenes of buildings built with wavy, corrugated roofing that often times had signs of rust on it. Nowadays, technology has brought about desirable properties that include rust resistant features, which is a large reason why the roofs have made such a comeback in the residential sector. 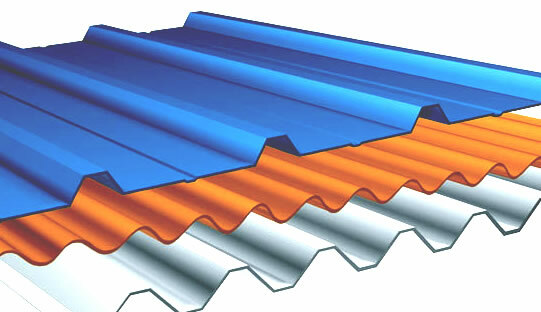 In terms of construction, the corrugated sheets are laid similar to the method used with tiled shingles, where an overlap exists between two or three neighboring sheets, with each overlap measuring about 150 mm. This overlap, when performer properly, makes corrugated roofs completely waterproof. In the corrugation process today, roofers utilize a method called roll forming. This is a highly automated process that is good for reducing costs that come with labor, and consequently increasing the efficiency involved in production. Other parts of the sheet-making process include pulling off large rolls of corrugated metal through rolling dies that are responsible for the recognizable waves that this type of roofing is known for. While the waves are usually rounded, different shapes and sizes can be achieved simply by changing the dies.